Chandigarh : Sharda Sarvhitkari Model Sr.Sec School Sec 40-D Chandigarh, has always laid emphasis on the holistic development of a child. Along with other issues health is also given a lot of importance in the school activities. Keeping this in mind equal importance was given to the said activity, “most pledges Received” for health campaign. 1266 students with their parents and school staff (1266 + 436) participated in this activity. The message was to create awareness among the children about good health and the role of fibers in the diet. A special programme was organized in the morning Assembly to convey this message. A speech highlighted the necessary dietary habits of students an focused upon the fruits and vegetables having the maximum percentage of fibers. A small skit by primary and senior classes envisaged the conversation and advice of fruits and vegetables. Dressed as various food items, they gave the message of healthy eating. Pizzas, cakes, pasteries and other junk food were pushed back by the healthy foods. 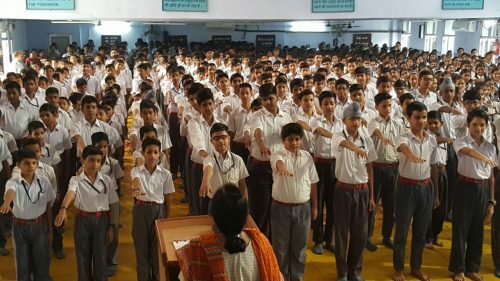 A pledge was then taken by the entire school from classes 1st to 12th about eating fibers on a daily basis and to maintain good health. Prior to this Dr. Geetika Thakur Sr.Consultent in Bedi Hospital Sec 33-A Chandigarh gave am inspirational speech on health, nutrition and diet. In this interactive session, she answered to various queries from the students while busting many myths regarding food. The notice boards of the schools colourfully echoed the same theme. The Principal of the school Sh. B.S.Kanwar, stressed that this campaign can only be successful only if the message conveyed is fully implemented. He spoke about the role of fibers in preventing many diseases of the digestive system. Appreciating the efforts of the Sarvhitkari Shiksha Samiti in this noble cause, he said that today’s child sorely needed such messages as junk food is catching everyone’s fancy.